Having a lot of Duplicate photos makes your device looks congested and inefficient to use. While you are having limited space and duplicate photos are a lot, it will be frustrating for you. The Duplicate images take most of your device space. Definitely, you don’t need anything that can make your device slow by taking a lot of space or something that is useless to you. It can also be the case that you have downloaded the same images while surfing the similar and one of your favorite content and then you find them and started searching for the methods to get rid of duplicate images/Photos and here you are. In such cases, Duplicate Photo Finders are kind of thing which you should be looking for, so if you are having Duplicate photos on your device then we have listed some Best Duplicate Photo Finders to Remove Duplicate Photos. These are some of the best software below to solve this problem. This is a software that can perform this amazing task for you if you are about to find duplicate images on your device. It searches and look for similar images/Photos and find all the duplicate images. 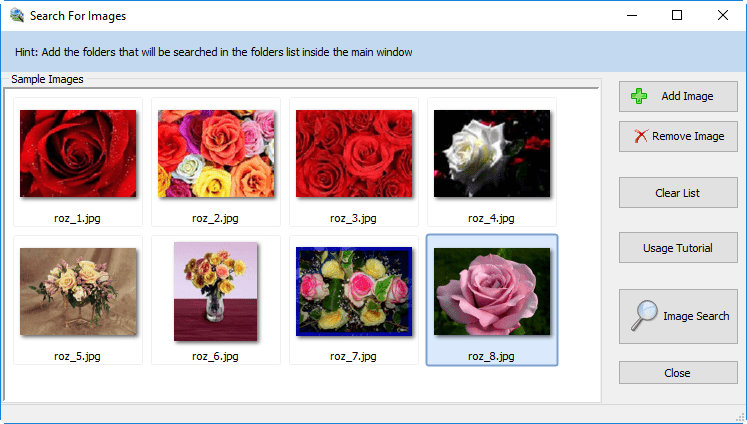 Duplicate Photo Finder supports almost all images formats including, RAW, JPG, PNG, TIFF, GIF and many other formats. It can even identify rotated, cropped or edited photos. Duplicate Photo Finder can identify resize pictures and rotated photos and flipped photos taken using different camera settings. With its very easy navigation, you can select files from different drives, using different dates and folders. It has built-in images viewer that allows you to view the images to compare and perform the required action. You can find this Software in two version, either Free version or Pro version which is the paid one. VisiPics is another software program which can help you out with deleting all those similar images you saw everytime you trying to find a specific old image. It just annoying because it increases you scrolls on window due to most of the duplicate photos are filling up the window and if you are not sure where exactly the picture was, you are about to waste a lot of time there. So, in such scenario VisiPics can perform the biggest role by finding duplicate photos, also it is very lightweight and faster than other software., so if you are worried that this software could take a lot of space on your systems hard drive then no need to worry about. Each time you Run VisiPics, it simply looks for similarity on images and shows them so you can preview those images before delete. You can choose which on you needed on those similar images. When it comes to other benefits with VisiPics then it gives highly efficient results with adjustable similarity levels, it has auto selection mode for duplicate photos, so it will probably save a lot of time while you are having not hundreds but thousands of images. 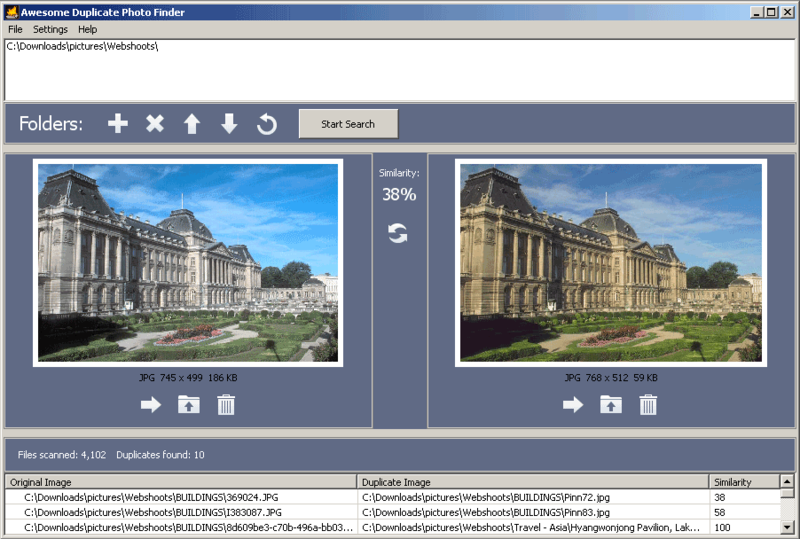 VisiPics Supports many image formats including, JPEG, GIF, PNG, BMP, PCX, TIFF, TGA, RAW etc. It is totally free software to use. Duplicate Photo Cleaner searches for similar images very deeply to recognize by searching the subject of the image, its pixels and other edited or cropped images, Unlike other software which compares and find duplicate images through their dates, their size, name, it finds the similarity in human perspective. It can even identify images from different angles. You can set Duplicate Photo Cleaner to find either exact duplicates or duplicates and similar photos. You can find black and white similar photos by using its grayscale comparison. This software is available for both Windows and Mac platforms. Duplicate Photo Cleaner also gives you options to manage Duplicate photos in single click, if you just want to have them as a backup or something like that, all you need to do is, run the duplicasy test in which Duplicate Photo finder will perform all the task and find the duplicate images and show you all the images in two sections. The one with the original one, and the one with the Duplicate one, Since it gives you options, so now it’s upon you whether or not you wanted to move them into a different folder or just delete them. The system requirements of this software is not so much and to make it run in your system you just need 5MB of space in you HDD and 128MB of Ram. As the name specifies, it’s another best software which makes the duplicate photo finding process easy for you, so you can free up lots of gigabytes of your device space. You can start a scan using Easy Duplicate Finder to find all the similar and duplicate images very accurately and efficiently. You can preview those photos before deletion of them. It supports all the popular image file formats. With its three-step process, you can easily get rid of duplicate images/photos. You can even find and delete duplicates from Google Drive and Dropbox as welI. It also supports Windows and MAC both platforms. 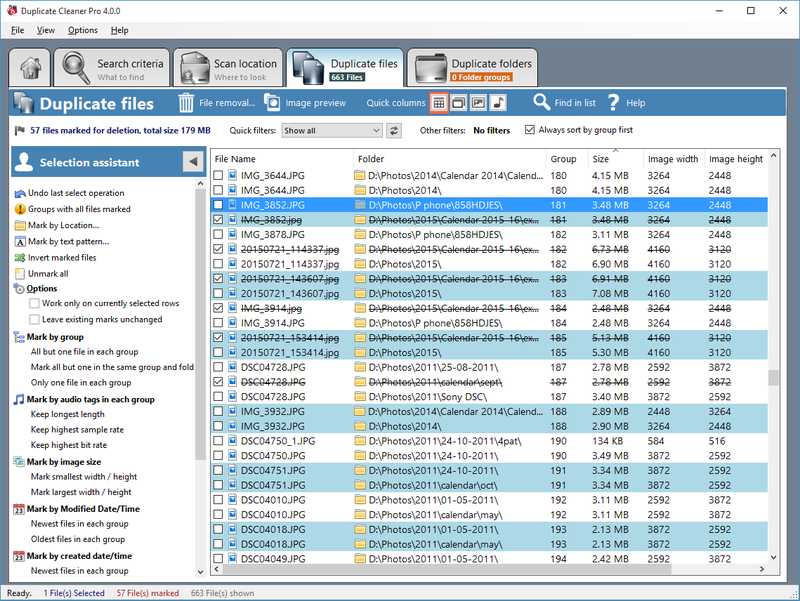 Not only images bur Easy Duplicate Finder also helps you with finding other kinds of duplicate files as well, such as MP3s, Documents, Videos, and much more. This software also features an Undo button for emergency recovery, custom scan modes, duplicate file management wizards and assistant. 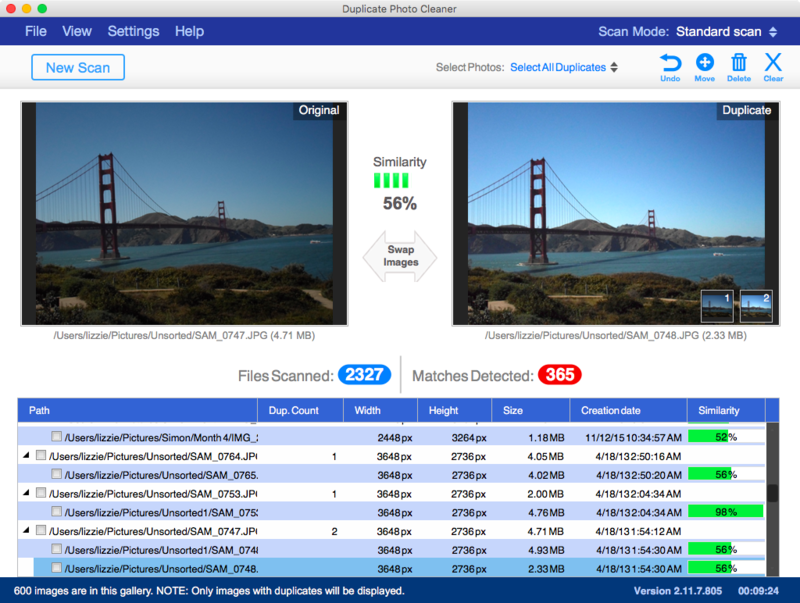 This is an amazing tool specialized for finding Duplicate and similar photos and removes them. It is very lightweight software that doesn’t require any registration and it’s completely free to use. It is very genuine software with no adware or spyware in it. You can start deleting duplicate photos just by drag and dropping some of the suspected folders into the software. After selecting or dropping folders to scan you can simply press start scan button to start the scan and leave rest for Awesome Duplicate Photo Finder. Usually, duplicate photo finders do not occupy a lot of space to install and run so this software does that too, you just need 5MB of space on your Hard Drive. 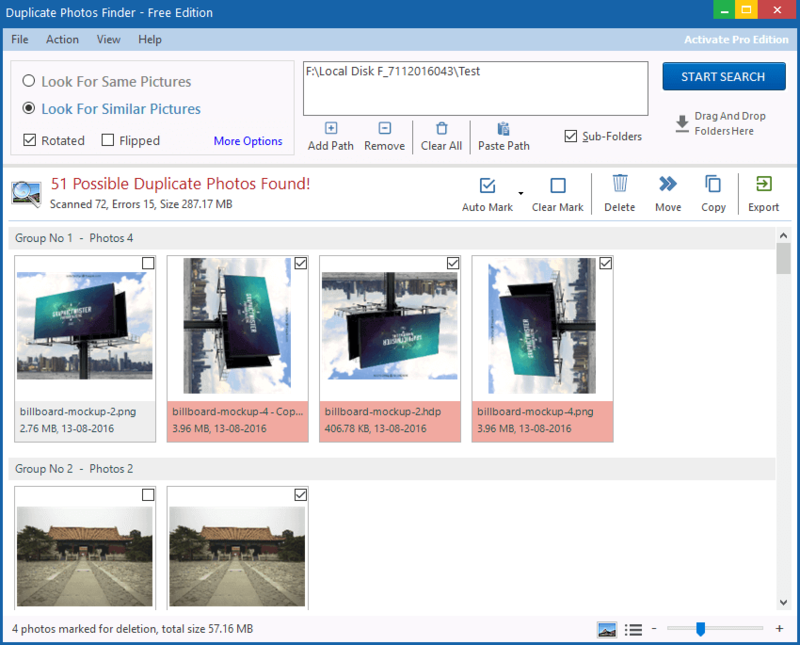 Duplicate Photo Fixer Pro is a unique Duplicate Photo Finder software that supports Windows, Mac, iOS, and Android as well. So, in term of platforms to support, this software seems to satisfy users need. You can start scanning for Duplicate photos just by creating the scanning list. Using this software you can set the Matching level for the desired result. It auto-marks duplicate images to easily delete them. This software can also be used to scan other external devices, so if you have the software in your PC and you want to scan your mobile device then just connect it to your PC and this software will take care of rest. It comes with Trial and Pro version. Duplicate Cleaner is very effortless to use. With its great features, you can easily clean-up duplicate images. It is also very reliable to find and delete another kind of duplicate files or folders. You can easily set the level of image comparison to find and delete images. 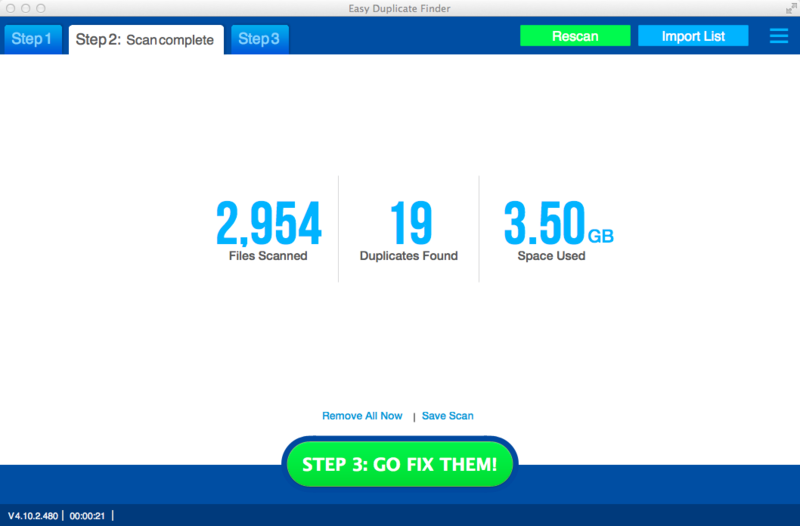 Duplicate Cleaner also provides you the facility of a unique Selection Assistant will help pick the files to remove. It finds duplicate images even when they are edited, rotated or resized. This software finds the duplicate images by examining them visually and to do that it uses advanced algorithms to find duplicate photos in a way that a human does. 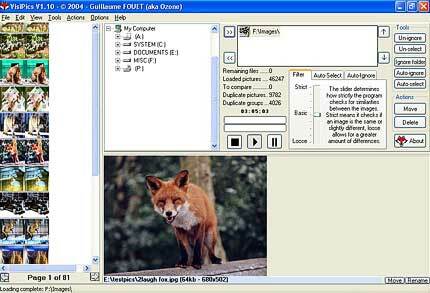 The algoritm makes this software find the duplicasy on images even when they are in different image formats or sizes. You simply need to run the scan and it will find the duplicate images and mark them, so you can proceed on deleting those images and free some precious space on your Hard Drive. The size of this software is just 3MB so, don’t worry if you are having less space on your Hard drive.